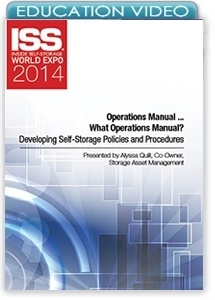 Learn how to create a self-storage operations manual of policies and procedures for your facility, use it to improve the business, and get employees to embrace and buy in to the new processes. An operations manual is critical to the success of your self-storage operation, and it doesn't have to be difficult to create one. In this session, you'll learn how to create a manual of policies and procedures for your facility and use it to improve the business. Our presenter will share a manual outline and insight for how to best use and maintain your new guide. You'll also walk away with tips for successfully implementing your policies and procedures with staff.